Angeles City is a melting pot of various lifestyle, flashy entertainment, and mouth-watering cuisines. 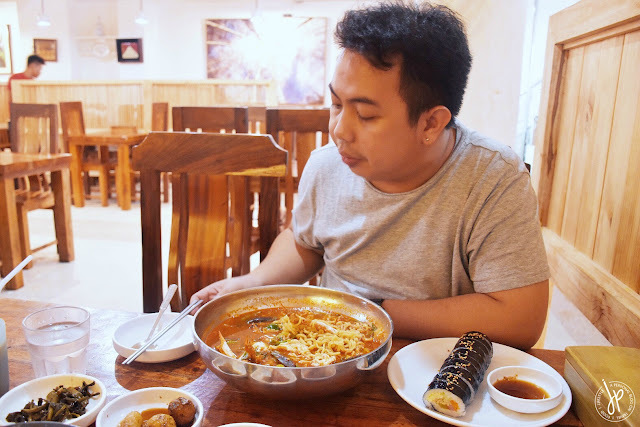 As we frequent Clark on weekends, my husband and I like to discover different food establishments found in Clark and in the heart of Angeles City, Pampanga. One weekend, we stumbled upon a Korean restaurant called Kimchi and we’ve been regular customers since 2016. 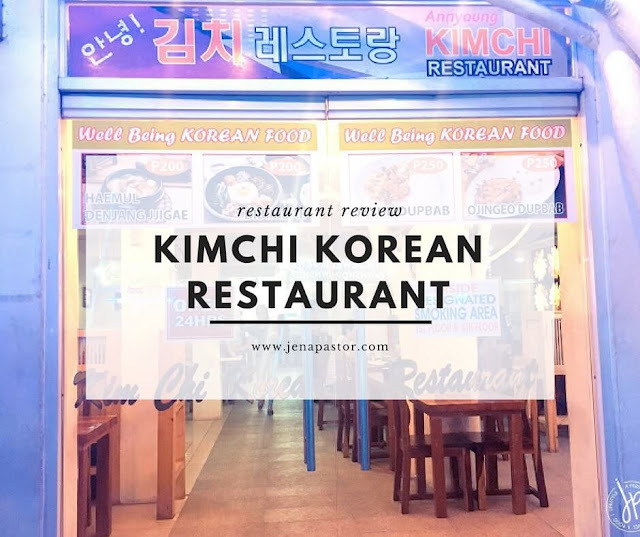 I’ll be honest with you – Kimchi isn’t an upmarket restaurant and they’re not the best place for Samgyeopsal, BUT they serve authentic Korean cuisine at very affordable prices. 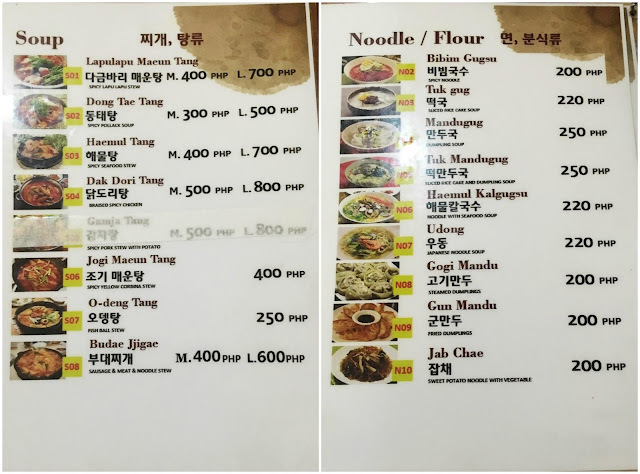 Owned by two Koreans, this restaurant is located right in Angeles City’s Red Light District. 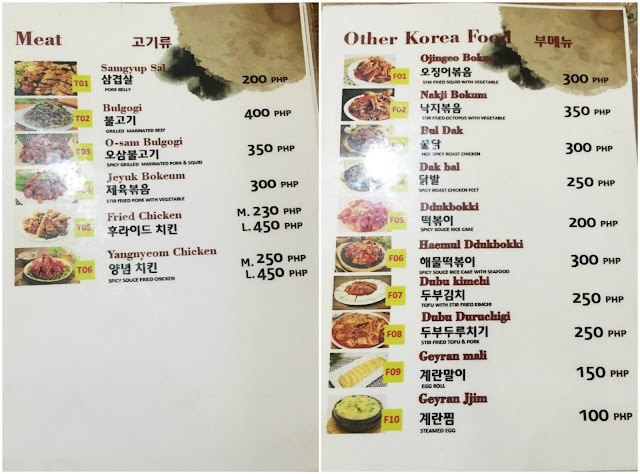 While the customers come from various walks of life, nationalities, jobs, and ages, the only common thing customers share is their appetite for Korean food. 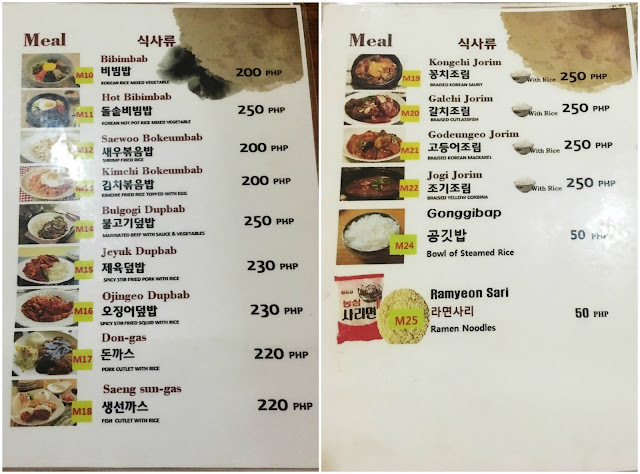 We’ve already tried several of their dishes, but of course, every time we crave for Korean food we always end up going for our favorites. 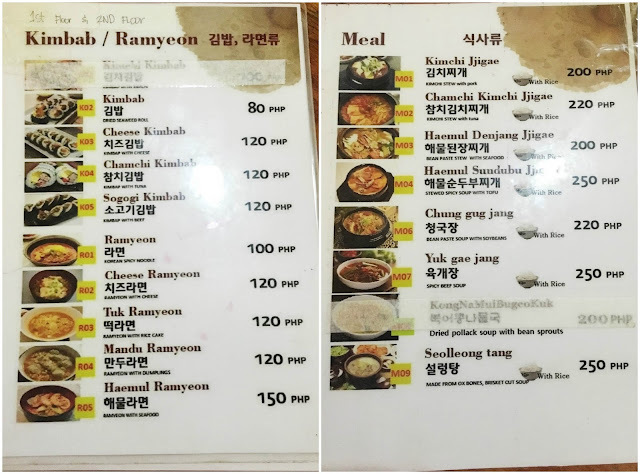 My husband used to order anything that comes with rice, but recently he’s been looking forward to Kimchi Restaurant’s Seafood Ramyeon. This bowl of ramyeon is HUGE that it can be shared by two people (at least that’s what we did at first). 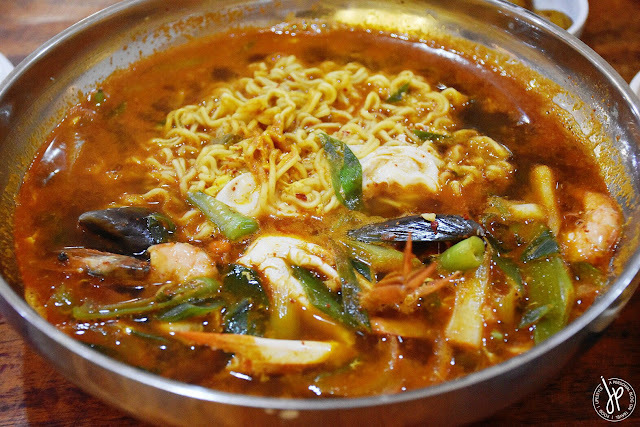 This ramyeon is spicy and so delicious, and has generous amount of shrimp, mussels, and crab. 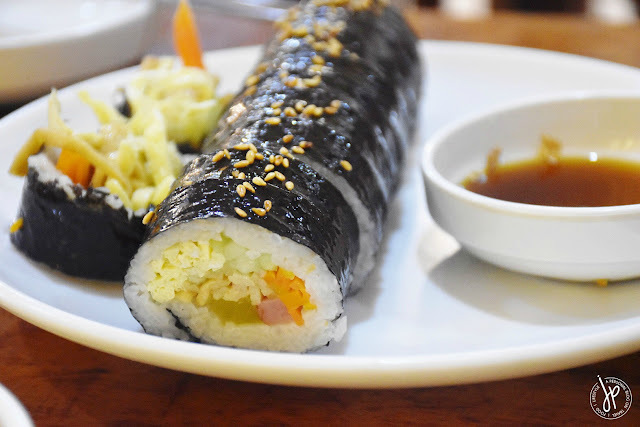 Aside from ramyeon, my husband orders the regular Kimbap which is freshly made all the time. 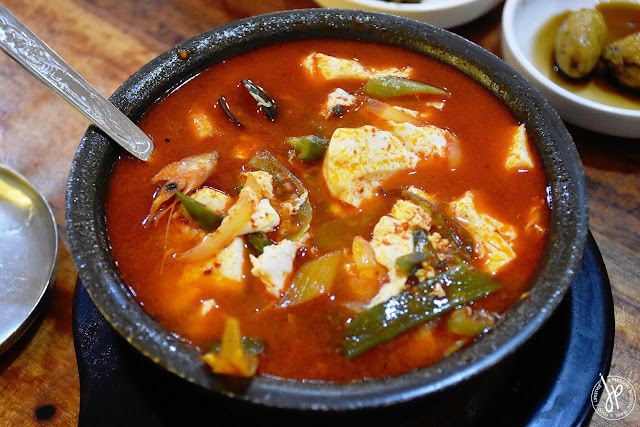 As for me, my go-to Korean dish is Haemul Sundubu Jjigae or Spicy Soft Tofu Stew with Seafood. I love anything that has tofu in it, so when I first ordered it, I knew that I’ll be getting this one again and again. Its small pot can be deceiving, but it’s actually filled with generous serving of shrimp, mussels, squid, and a truckload of soft tofu. Haemul Sundubu Jjigae is a hearty and flavourful spicy stew and can be eaten with or without rice. If you can’t handle too much spiciness, I suggest telling the staff to prepare this with a mild spice level. I ordered Kaya’s version but was very disappointed for the expensive price point and the taste is incomparable to Kimchi’s. 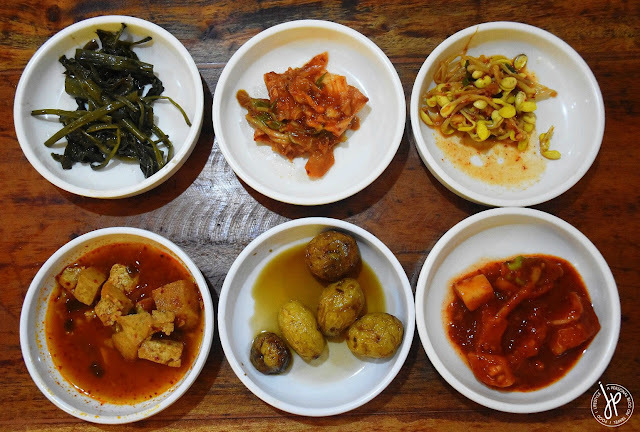 For every order, Kimchi Korean Restaurant provides us with 6 different side dishes consisting of kangkong, kimchi, bean sprout, tofu, marble potatoes, and radish. These are all free. We also get complimentary iced coffee and a pitcher of water for our drinks. 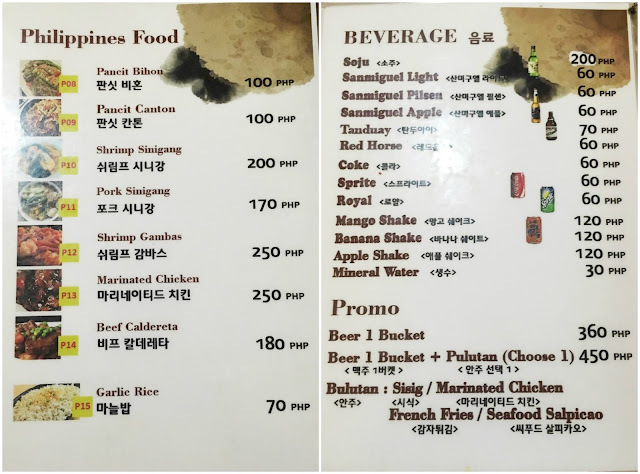 Our entire dinner only costs us Php 480 (US$ 9.50). 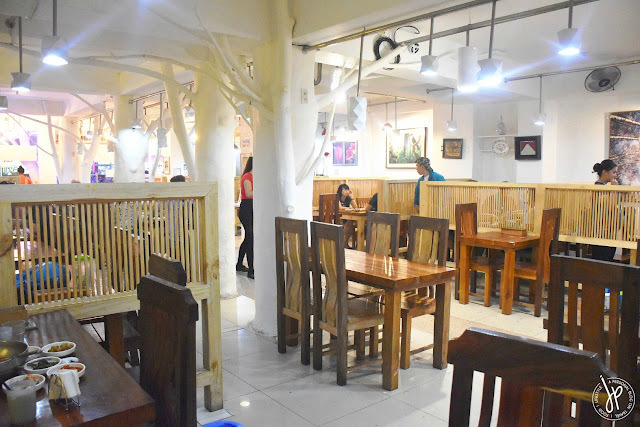 The interior of the restaurant is very simple, but they did invest on wooden tables and chairs. They have a separate restroom for male and female on the first floor and a small smoking area. The first and second floors are dedicated for the main restaurant’s dining areas, third floor for an open KTV lounge and live band (which you can hear all the way to the first floor), and fourth floor for the billiards hall. 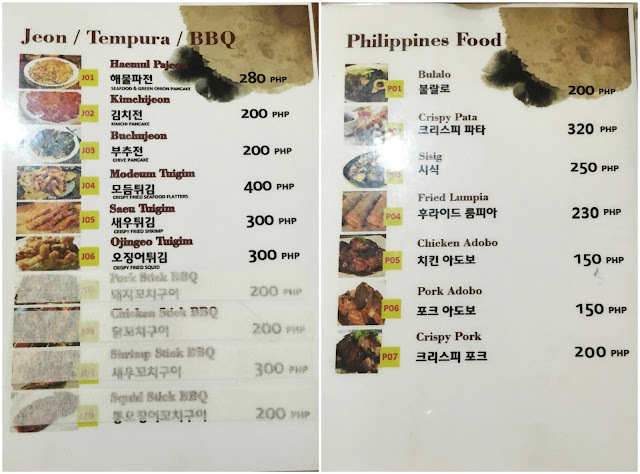 The restaurant is open for 24 hours so whenever you feel like eating Korean food (or you're waiting for someone to arrive at nearby Clark International Airport), this one can always satisfy your cravings. Kimchi Korean Restaurant is located at Fields Avenue on the side of Natalia Hotel. Fields Avenue is right behind Jollibee – Manuel A. Roxas Highway near the Bayanihan Terminal Parking Lot. Disclaimer: This is not a sponsored post. The contents of this entry are purely my opinion and 100% honest based on my dining experience.